1 A None No Power Seat 1 A is a standard business class seat. The proximity of the bar and galley may be bothersome. 1 B None No Power Seat 1 B is a standard business class seat. The proximity of the bar and galley may be bothersome. 1 J None No Power Seat 1 J is a standard business class seat. The proximity of the bar and galley may be bothersome. 1 K None No Power Seat 1 K is a standard business class seat. The proximity of the bar and galley may be bothersome. 10 A None No Power Seat 10 A is standard economy class seat. 10 B None No Power Seat 10 B is standard economy class seat. 10 D None No Power Seat 10 D is standard economy class seat. 10 E None No Power Seat 10 E is standard economy class seat. 10 F None No Power Seat 10 F is standard economy class seat. 10 G None No Power Seat 10 G is standard economy class seat. 10 J None No Power Seat 10 J is standard economy class seat. 10 K None No Power Seat 10 K is standard economy class seat. 11 A None No Power Seat 11 A is standard economy class seat. 11 B None No Power Seat 11 B is standard economy class seat. 11 D None No Power Seat 11 D is standard economy class seat. 11 E None No Power Seat 11 E is standard economy class seat. 11 F None No Power Seat 11 F is standard economy class seat. 11 G None No Power Seat 11 G is standard economy class seat. 11 J None No Power Seat 11 J is standard economy class seat. 11 K None No Power Seat 11 K is standard economy class seat. 12 A None No Power Seat 12 A is standard economy class seat. 12 B None No Power Seat 12 B is standard economy class seat. 12 D None No Power Seat 12 D is standard economy class seat. 12 E None No Power Seat 12 E is standard economy class seat. 12 F None No Power Seat 12 F is standard economy class seat. 12 G None No Power Seat 12 G is standard economy class seat. 12 J None No Power Seat 12 J is standard economy class seat. 12 K None No Power Seat 12 K is standard economy class seat. 14 A None No Power Seat 14 A is standard economy class seat. 14 B None No Power Seat 14 B is standard economy class seat. 14 D None No Power Seat 14 D is standard economy class seat. 14 E None No Power Seat 14 E is standard economy class seat. 14 F None No Power Seat 14 F is standard economy class seat. 14 G None No Power Seat 14 G is standard economy class seat. 14 J None No Power Seat 14 J is standard economy class seat. 14 K None No Power Seat 14 K is standard economy class seat. 15 A None No Power Seat 15 A is standard economy class seat. 15 B None No Power Seat 15 B is standard economy class seat. 15 D None No Power Seat 15 D is standard economy class seat. 15 E None No Power Seat 15 E is standard economy class seat. 15 F None No Power Seat 15 F is standard economy class seat. 15 G None No Power Seat 15 G is standard economy class seat. 15 J None No Power Seat 15 J is standard economy class seat. 15 K None No Power Seat 15 K is standard economy class seat. 16 A None No Power Seat 16 A is standard economy class seat. 16 B None No Power Seat 16 B is standard economy class seat. 16 D None No Power Seat 16 D is standard economy class seat. 16 E None No Power Seat 16 E is standard economy class seat. 16 F None No Power Seat 16 F is standard economy class seat. 16 G None No Power Seat 16 G is standard economy class seat. 16 J None No Power Seat 16 J is standard economy class seat. 16 K None No Power Seat 16 K is standard economy class seat. 17 A None No Power Seat 17 A is standard economy class seat. 17 B None No Power Seat 17 B is standard economy class seat. 17 D None No Power Seat 17 D is standard economy class seat. 17 E None No Power Seat 17 E is standard economy class seat. 17 F None No Power Seat 17 F is standard economy class seat. 17 G None No Power Seat 17 G is standard economy class seat. 17 J None No Power Seat 17 J is standard economy class seat. 17 K None No Power Seat 17 K is standard economy class seat. 18 A None No Power Seat 18 A is standard economy class seat. 18 B None No Power Seat 18 B is standard economy class seat. 18 D None No Power Seat 18 D is standard economy class seat. 18 E None No Power Seat 18 E is standard economy class seat. 18 F None No Power Seat 18 F is standard economy class seat. 18 G None No Power Seat 18 G is standard economy class seat. 18 J None No Power Seat 18 J is standard economy class seat. 18 K None No Power Seat 18 K is standard economy class seat. 19 A None No Power Seat 19 A is standard economy class seat. 19 B None No Power Seat 19 B is standard economy class seat. 19 D None No Power Seat 19 D is standard economy class seat. 19 E None No Power Seat 19 E is standard economy class seat. 19 F None No Power Seat 19 F is standard economy class seat. 19 G None No Power Seat 19 G is standard economy class seat. 19 J None No Power Seat 19 J is standard economy class seat. 19 K None No Power Seat 19 K is standard economy class seat. 20 A None No Power Seat 20 A is standard economy class seat that may have limited recline. The proximity to the lavatory may be bothersome. 20 B None No Power Seat 20 B is standard economy class seat that may have limited recline. The proximity to the lavatory may be bothersome. 20 D None No Power Seat 20 D is standard economy class seat. Proximity to the lavatory may be bothersome. 20 E None No Power Seat 20 E is standard economy class seat. 20 F None No Power Seat 20 F is standard economy class seat. 20 G None No Power Seat 20 G is standard economy class seat. Proximity to the lavatory may be bothersome. 20 J None No Power Seat 20 J is standard economy class seat that may have limited recline. The proximity to the lavatory may be bothersome. 20 K None No Power Seat 20 K is standard economy class seat that may have limited recline. The proximity to the lavatory may be bothersome. 21 D None No Power Seat 21 D is standard economy class seat that may have limited recline. The proximity to the lavatory may be bothersome. 21 E None No Power Seat 21 E is standard economy class seat that may have limited recline. The proximity to the lavatory may be bothersome. 21 F None No Power Seat 21 F is standard economy class seat that may have limited recline. The proximity to the lavatory may be bothersome. 21 G None No Power Seat 21 G is standard economy class seat that may have limited recline. The proximity to the lavatory may be bothersome. 22 A None No Power Seat 22 A has extra room due to the exit, however, the exit door may be bothersome. Passengers often congregate in the area in front of this row during flight. The tray table is in the armrest, making the armrests immovable and slightly reducing seat width. There is no floor storage for this seat during takeoff and landing. It can get very cold by the exits during flight. 22 B None No Power Seat 22 B has extra room due to the exit. However, passengers often congregate in the area in front of this row during flight. The tray table is in the armrest, making the armrests immovable and slightly reducing seat width. There is no floor storage for this seat during takeoff and landing. It can get very cold by the exits during flight. 22 D None No Power Seat 22 D has extra room due to the exit. However, passengers often congregate in the area in front of this row during flight and the stairs may be bothersome. The tray tables are in the armrests, making the armrests immovable and slightly reducing seat width. There is no floor storage for this seat during takeoff and landing. It can get very cold by the exits during flight. 22 E None No Power Seat 22 E has extra room due to the exit. However, passengers often congregate in the area in front of this row during flight and the stairs may be bothersome. The tray tables are in the armrests, making the armrests immovable and slightly reducing seat width. There is no floor storage for this seat during takeoff and landing. It can get very cold by the exits during flight. 22 F None No Power Seat 22 F has extra room due to the exit. However, passengers often congregate in the area in front of this row during flight and the stairs may be bothersome. The tray tables are in the armrests, making the armrests immovable and slightly reducing seat width. There is no floor storage for this seat during takeoff and landing. It can get very cold by the exits during flight. 22 G None No Power Seat 22 G has extra room due to the exit. However, passengers often congregate in the area in front of this row during flight and the stairs may be bothersome. The tray tables are in the armrests, making the armrests immovable and slightly reducing seat width. There is no floor storage for this seat during takeoff and landing. It can get very cold by the exits during flight. 22 J None No Power Seat 22 J has extra room due to the exit. 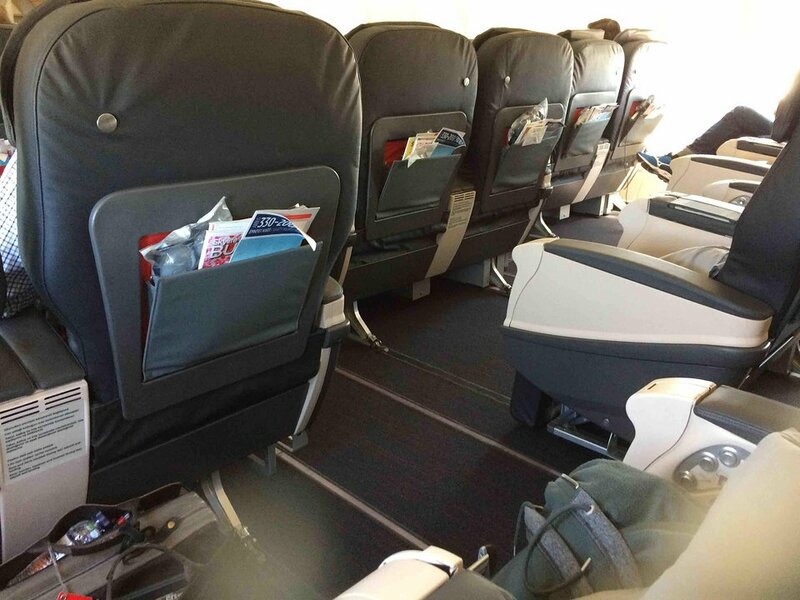 However, passengers often congregate in the area in front of this row during flight. The tray table is in the armrest, making the armrests immovable and slightly reducing seat width. There is no floor storage for this seat during takeoff and landing. It can get very cold by the exits during flight. 22 K None No Power Seat 22 K has extra room due to the exit, however, the exit door may be bothersome. Passengers often congregate in the area in front of this row during flight. The tray table is in the armrest, making the armrests immovable and slightly reducing seat width. There is no floor storage for this seat during takeoff and landing. It can get very cold by the exits during flight. 23 A None No Power Seat 23 A is standard economy class seat. 23 B None No Power Seat 23 B is standard economy class seat. 23 D None No Power Seat 23 D is standard economy class seat. 23 E None No Power Seat 23 E is standard economy class seat. 23 F None No Power Seat 23 F is standard economy class seat. 23 G None No Power Seat 23 G is standard economy class seat. 23 J None No Power Seat 23 J is standard economy class seat. 23 K None No Power Seat 23 K is standard economy class seat. 24 A None No Power Seat 24 A is standard economy class seat. 24 B None No Power Seat 24 B is standard economy class seat. 24 D None No Power Seat 24 D is standard economy class seat. 24 E None No Power Seat 24 E is standard economy class seat. 24 F None No Power Seat 24 F is standard economy class seat. 24 G None No Power Seat 24 G is standard economy class seat. 24 J None No Power Seat 24 J is standard economy class seat. 24 K None No Power Seat 24 K is standard economy class seat. 25 A None No Power Seat 25 A is standard economy class seat. 25 B None No Power Seat 25 B is standard economy class seat. 25 D None No Power Seat 25 D is standard economy class seat. 25 E None No Power Seat 25 E is standard economy class seat. 25 F None No Power Seat 25 F is standard economy class seat. 25 G None No Power Seat 25 G is standard economy class seat. 25 J None No Power Seat 25 J is standard economy class seat. 25 K None No Power Seat 25 K is standard economy class seat. 26 A None No Power Seat 26 A is standard economy class seat. 26 B None No Power Seat 26 B is standard economy class seat. 26 D None No Power Seat 26 D is standard economy class seat. 26 E None No Power Seat 26 E is standard economy class seat. 26 F None No Power Seat 26 F is standard economy class seat. 26 G None No Power Seat 26 G is standard economy class seat. 26 J None No Power Seat 26 J is standard economy class seat. 26 K None No Power Seat 26 K is standard economy class seat. 27 A None No Power Seat 27 A is standard economy class seat. 27 B None No Power Seat 27 B is standard economy class seat. 27 D None No Power Seat 27 D is standard economy class seat. 27 E None No Power Seat 27 E is standard economy class seat. 27 F None No Power Seat 27 F is standard economy class seat. 27 G None No Power Seat 27 G is standard economy class seat. 27 J None No Power Seat 27 J is standard economy class seat. 27 K None No Power Seat 27 K is standard economy class seat. 28 A None No Power Seat 28 A is standard economy class seat. 28 B None No Power Seat 28 B is standard economy class seat. 28 D None No Power Seat 28 D is standard economy class seat. 28 E None No Power Seat 28 E is standard economy class seat. 28 F None No Power Seat 28 F is standard economy class seat. 28 G None No Power Seat 28 G is standard economy class seat. 28 J None No Power Seat 28 J is standard economy class seat. 28 K None No Power Seat 28 K is standard economy class seat. 29 A None No Power Seat 29 A is standard economy class seat. 29 B None No Power Seat 29 B is standard economy class seat. 29 D None No Power Seat 29 D is standard economy class seat. 29 E None No Power Seat 29 E is standard economy class seat. 29 F None No Power Seat 29 F is standard economy class seat. 29 G None No Power Seat 29 G is standard economy class seat. 29 J None No Power Seat 29 J is standard economy class seat. 29 K None No Power Seat 29 K is standard economy class seat. 3 D None No Power Seat 3 D is a standard business class seat. The proximity to the galley may be bothersome. 3 E None No Power Seat 3 E is a standard business class seat. The proximity to the galley may be bothersome. 30 A None No Power Seat 30 A is standard economy class seat. 30 B None No Power Seat 30 B is standard economy class seat. 30 D None No Power Seat 30 D is a standard Economy Class seat. However this seat may often be bumped by service carts or others passing by due to the awkward configuration transition from 4 to 3 seats. 30 E None No Power Seat 30 E is standard economy class seat. 30 F None No Power Seat 30 F is standard economy class seat. 30 G None No Power Seat 30 G is a standard Economy Class seat. However this seat may often be bumped by service carts or others passing by due to the awkward configuration transition from 4 to 3 seats. 30 J None No Power Seat 30 J is standard economy class seat. 30 K None No Power Seats 30 K are standard economy seats. 31 A None No Power Seat 31 A is standard economy class seat. 31 B None No Power Seat 31 B is standard economy class seat. 31 D None No Power Seat 31 D is a standard Economy Class seat however legroom may be restricted due to the awkward configuration transition from 4 to 3 seats. 31 E None No Power Seat 31 E is a standard Economy Class seat however legroom may be restricted due to the awkward configuration transition from 4 to 3 seats. 31 F None No Power Seat 31 F is a standard Economy Class seat however legroom may be restricted due to the awkward configuration transition from 4 to 3 seats. 31 J None No Power Seat 31 J is standard economy class seat. 31 K None No Power Seat 31 K is standard economy class seat. 32 A None No Power Seat 32 A is standard economy class seat. 32 B None No Power Seat 32 B is standard economy class seat. 32 D None No Power Seat 32 D is standard economy class seat. 32 E None No Power Seat 32 E is standard economy class seat. 32 F None No Power Seat 32 F is standard economy class seat. 32 J None No Power Seat 32 J is standard economy class seat. 32 K None No Power Seat 32 K is standard economy class seat. 33 A None No Power Seat 33 A is standard economy class seat. 33 B None No Power Seat 33 B is standard economy class seat. 33 D None No Power Seat 33 D is standard economy class seat. 33 E None No Power Seat 33 E is standard economy class seat. 33 F None No Power Seat 33 F is standard economy class seat. 33 J None No Power Seat 33 J is standard economy class seat. 33 K None No Power Seat 33 K is standard economy class seat. 34 A None No Power Seat 34 A is standard economy class seat. 34 B None No Power This seat 34 B is a standard economy class seat in the second to last row of the plane. This seat may seem cramped due to the curvature of the rear of this aircraft. The proximity to the galley may be bothersome. 34 D None No Power This seat 34 D is a standard economy class seat in the last row of the plane. This seat may have limited recline. The proximity to the galley may be bothersome. 34 E None No Power This seat 34 E is a standard economy class seat in the last row of the plane. This seat may have limited recline. The proximity to the galley may be bothersome. 34 F None No Power This seat 34 F is a standard economy class seat in the last row of the plane. This seat may have limited recline. The proximity to the galley may be bothersome. 34 J None No Power This seat 34 J is a standard economy class seat in the second to last row of the plane. This seat may seem cramped due to the curvature of the rear of this aircraft. The proximity to the galley may be bothersome. 34 K None No Power Seat 34 K is standard economy class seat. 35 A None No Power This seat 35 A is a standard economy class seat in the last row of the plane. This seat may have limited recline. The proximity to the galley may be bothersome. 35 B None No Power This seat 35 B is a standard economy class seat in the last row of the plane. This seat may have limited recline. The proximity to the galley may be bothersome. 35 J None No Power This seat 35 J is a standard economy class seat in the last row of the plane. This seat may have limited recline. The proximity to the galley may be bothersome. 35 K None No Power This seat 35 K is a standard economy class seat in the last row of the plane. This seat may have limited recline. The proximity to the galley may be bothersome. 4 A None No Power Seat 4 A is a standard business class seat. The proximity to the galley may be bothersome. 4 B None No Power Seat 4 B is a standard business class seat. The proximity to the galley may be bothersome. 4 J None No Power Seat 4 J is a standard business class seat. The proximity to the galley may be bothersome. 4 K None No Power Seat 4 K is a standard business class seat. The proximity to the galley may be bothersome. 5 A None No Power Seat 5 A has restricted legroom due to the bulkhead. The tray tables are in the armrests, making the armrests immovable and slightly reducing seat width. The proximity of the lavatories and galleys can be bothersome. There is no floor storage during takeoff and landing. Passengers with infants are often seated in this row. 5 B None No Power Seat 5 B has restricted legroom due to the bulkhead. The tray tables are in the armrests, making the armrests immovable and slightly reducing seat width. The proximity of the lavatories and galleys can be bothersome. There is no floor storage during takeoff and landing. Passengers with infants are often seated in this row. 5 D None No Power Seat 5 D has restricted legroom due to the bulkhead. The tray tables are in the armrests, making the armrests immovable and slightly reducing seat width. The proximity of the lavatories and galleys can be bothersome. There is no floor storage during takeoff and landing. Passengers with infants are often seated in this row. 5 E None No Power Seat 5 E has restricted legroom due to the bulkhead. The tray tables are in the armrests, making the armrests immovable and slightly reducing seat width. The proximity of the lavatories and galleys can be bothersome. There is no floor storage during takeoff and landing. Passengers with infants are often seated in this row. 5 F None No Power Seat 5 F has restricted legroom due to the bulkhead. The tray tables are in the armrests, making the armrests immovable and slightly reducing seat width. The proximity of the lavatories and galleys can be bothersome. There is no floor storage during takeoff and landing. Passengers with infants are often seated in this row. 5 G None No Power Seat 5 G has restricted legroom due to the bulkhead. The tray tables are in the armrests, making the armrests immovable and slightly reducing seat width. The proximity of the lavatories and galleys can be bothersome. There is no floor storage during takeoff and landing. Passengers with infants are often seated in this row. 5 J None No Power Seat 5 J has restricted legroom due to the bulkhead. The tray tables are in the armrests, making the armrests immovable and slightly reducing seat width. The proximity of the lavatories and galleys can be bothersome. There is no floor storage during takeoff and landing. Passengers with infants are often seated in this row. 5 K None No Power Seat 5 K has restricted legroom due to the bulkhead. The tray tables are in the armrests, making the armrests immovable and slightly reducing seat width. The proximity of the lavatories and galleys can be bothersome. There is no floor storage during takeoff and landing. Passengers with infants are often seated in this row. 6 A None No Power Seat 6 A is standard economy class seat. 6 B None No Power Seat 6 B is standard economy class seat. 6 D None No Power Seat 6 D is standard economy class seat. 6 E None No Power Seat 6 E is standard economy class seat. 6 F None No Power Seat 6 F is standard economy class seat. 6 G None No Power Seat 6 G is standard economy class seat. 6 J None No Power Seat 6 J is standard economy class seat. 6 K None No Power Seat 6 K is standard economy class seat. 7 A None No Power Seat 7 A is standard economy class seat. 7 B None No Power Seat 7 B is standard economy class seat. 7 D None No Power Seat 7 D is standard economy class seat. 7 E None No Power Seat 7 E is standard economy class seat. 7 F None No Power Seat 7 F is standard economy class seat. 7 G None No Power Seat 7 G is standard economy class seat. 7 J None No Power Seat 7 J is standard economy class seat. 7 K None No Power Seat 7 K is standard economy class seat. 8 A None No Power Seat 8 A is standard economy class seat. 8 B None No Power Seat 8 B is standard economy class seat. 8 D None No Power Seat 8 D is standard economy class seat. 8 E None No Power Seat 8 E is standard economy class seat. 8 F None No Power Seat 8 F is standard economy class seat. 8 G None No Power Seat 8 G is standard economy class seat. 8 J None No Power Seat 8 J is standard economy class seat. 8 K None No Power Seat 8 K is standard economy class seat. 9 A None No Power Seat 9 A is standard economy class seat. 9 B None No Power Seat 9 B is standard economy class seat. 9 D None No Power Seat 9 D is standard economy class seat. 9 E None No Power Seat 9 E is standard economy class seat. 9 F None No Power Seat 9 F is standard economy class seat. 9 G None No Power Seat 9 G is standard economy class seat. 9 J None No Power Seat 9 J is standard economy class seat. 9 K None No Power Seat 9 K is standard economy class seat. 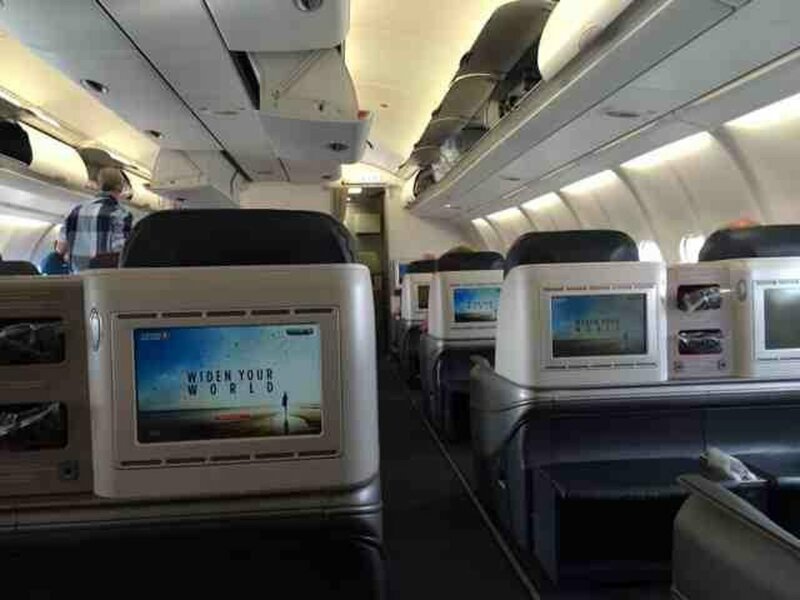 Each seat has a personal TV with Audio and Video onDemand that features 250 CDs. Each seat has a personal TV with Audio and Video onDemand that features 30 movies, 40 short films, and games. Power ports are available at all Business Class seats. There is no power in Economy. All A, B, J and K seats in Economy have limited underseat leg and storage room due to the presence of an entertainment equipment box. I think they often use the A330-300 for this flight, but this A330-203 was one of the most uncomfortable ever. 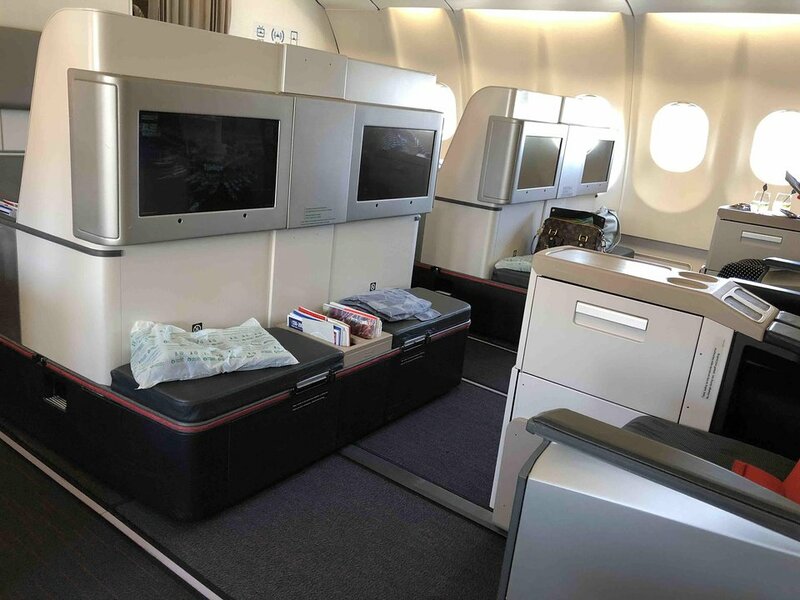 All economy window and aisle seats (A,B,J,K) plus E and F seats have HUGE boxes for entertainment system, so almost no leg room for a 12-hour flight. 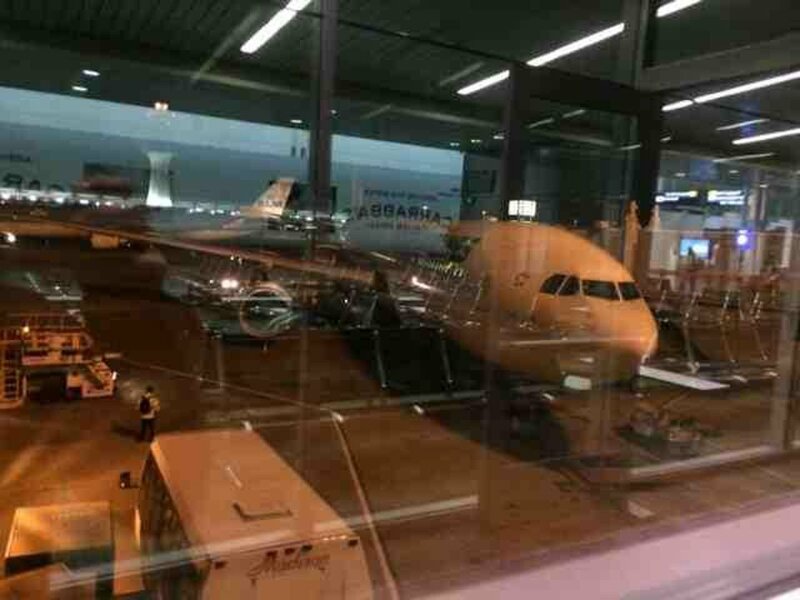 The worst ever experience on Turkish airlines. So bad I upgraded to Business on return flight; much better, but still only narrow angle lie-flat seats. Beware! The business class is of the more old angle-lie-flat seat. Earlier comments fully supported, the seats are even a bit narrow. I had a 12h flight and it was not very comfortable. More importantly, there was an electric breaktdown in most parts of the passenger cabin. This lead to a blackout of the entertainment system and none of the business class seats could be adjusted any more. Only luck was, that around 50% of the seats were occupied. So all passengers could sit in an upright seat for the landing. TK should consider to bring these aircrafts quickly into pension. I used a more modern version with lie flat beds, which were perfect. 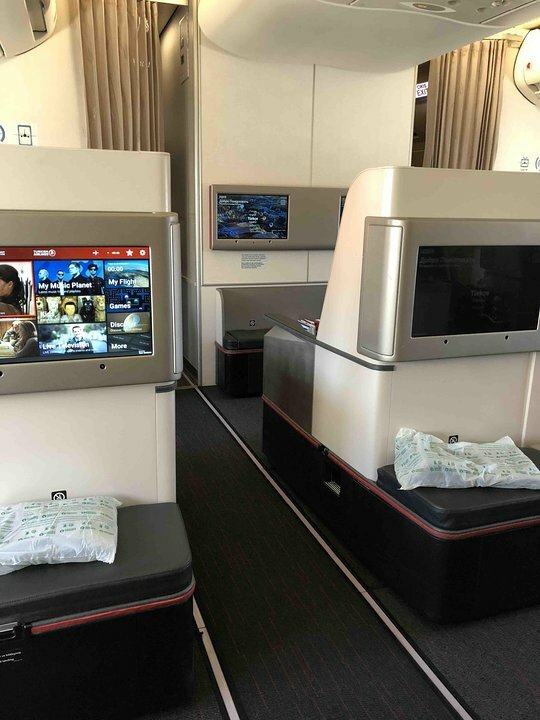 Turkish Airlines flies 4 versions of Airbus A330-200.